Arab terrorist tries to run over soldiers near Ofra but is shot dead. Large knife is discovered in the vehicle. Earlier, a Palestinian terrorist attempted to run down Israeli police and soldiers using his car at the Qalandiya checkpoint, near Ramallah. 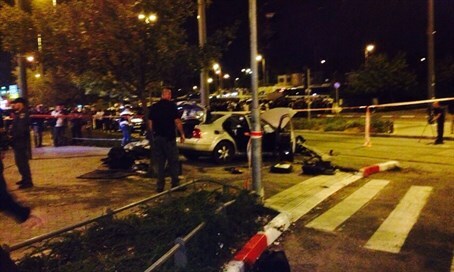 In this case too, the terrorist was shot and wounded without causing Israeli casualties. The incident occurred close to Qalandiya refugee camp, where soldiers on Wednesday shot dead two Palestinians who tried to ram their cars into troops in separate attacks.